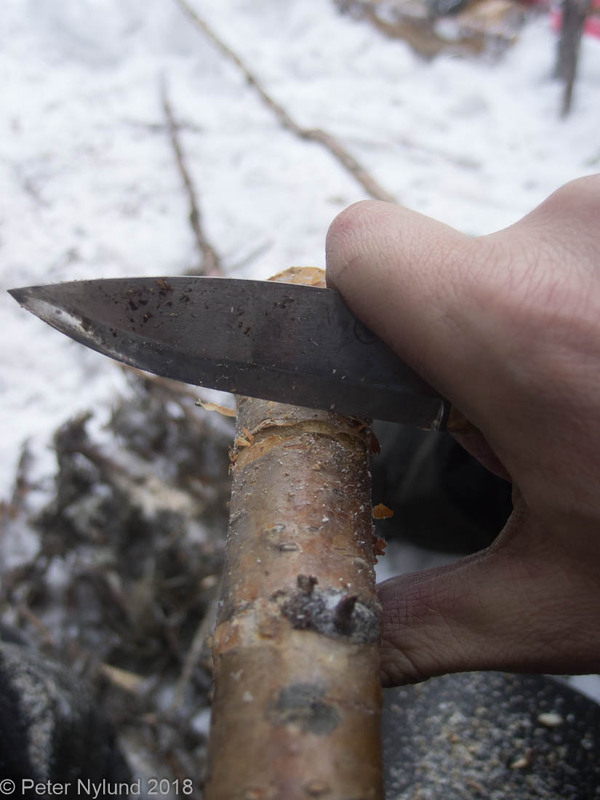 At the end of January it was time for the final course in the Vigu (Wilderness Guide) specialization in survival and bushcraft. This was also my final Vigu course, at least for now. I should graduate sometime during the spring. 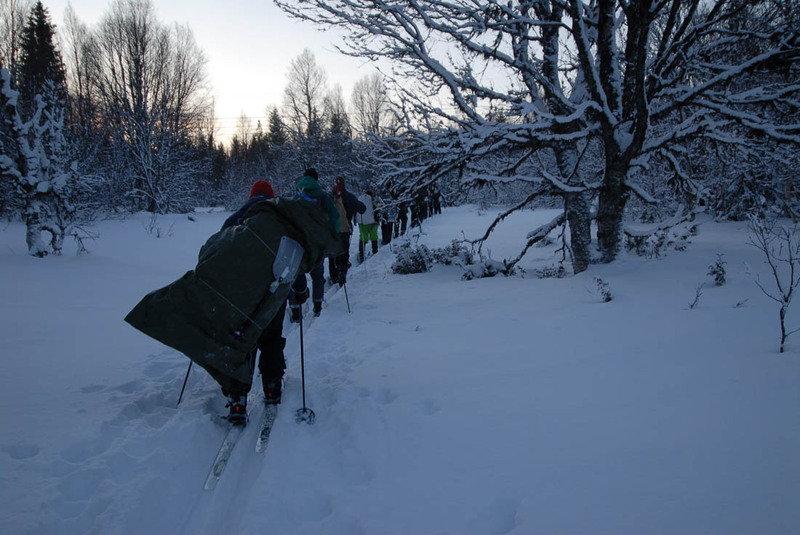 After the fall survival course our instructor, Ingvar Krancher from Sveriges Överlevnadscentrum, said that most people consider the winter survival course easier than the fall course and I believed him. How wrong I was! 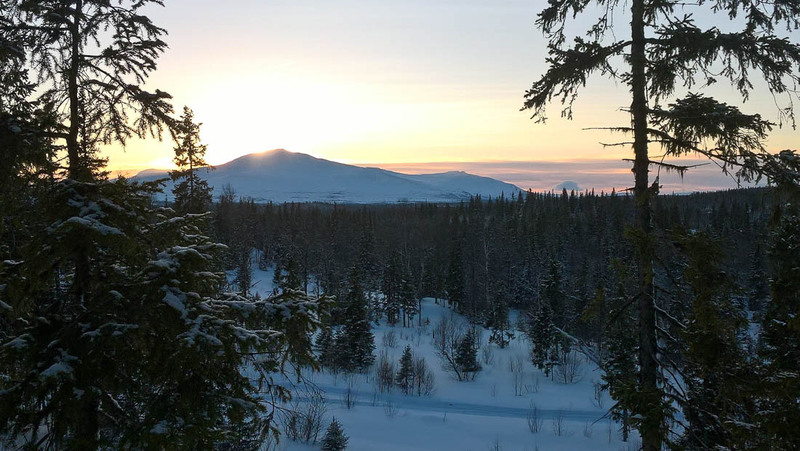 Anyway, we started with the night boat from Turku a Tuesday evening, arrived at Stockholm and drove the Vigu cars nine hours to Camp Ånn, situated about 30 km west from Åre in Jämtland. Nothing more to do that evening that to eat, go to the sauna and then sleep in anticipation of the following day. Thursday started with some theory after having eaten breakfast. We ate lunch and then went to check out some different shelter types and demonstrated some other necessary techniques, like in this case warming the toes in a buddy's armpit. It also tickles when you wiggle your toes. 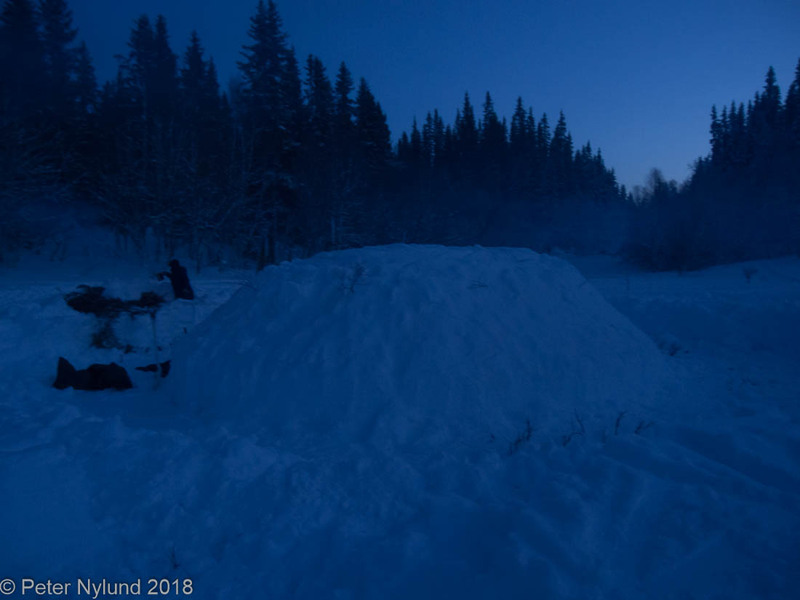 Around sunset we got going and skied about one hour before everyone was spread out in the terrain to make a snow hole to sleep in for the night. 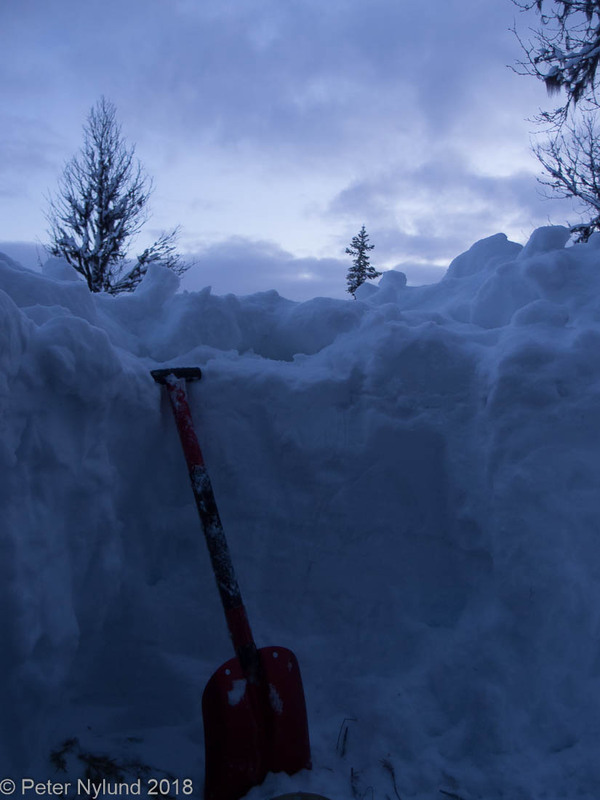 Morning from my snow hole. (Second picture by Danni). 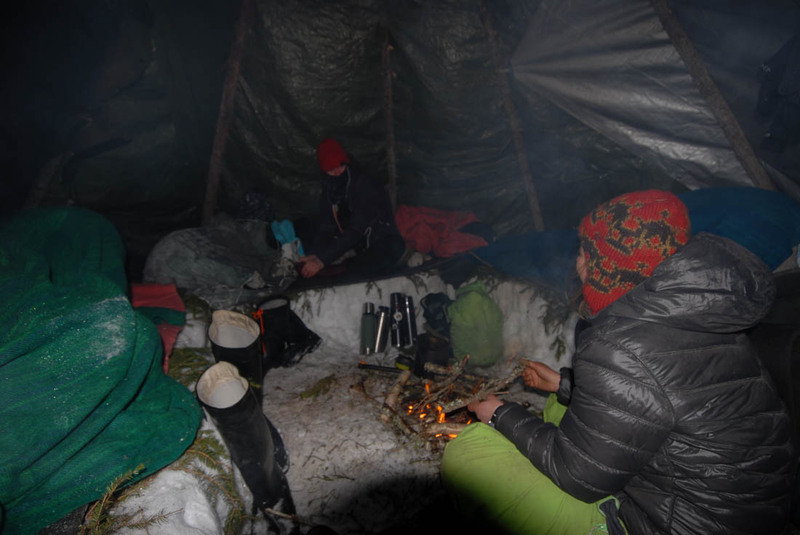 The night hadn't been particularly cold, maybe around -5°C, but my toe were a bit cold in the much to small blanket. 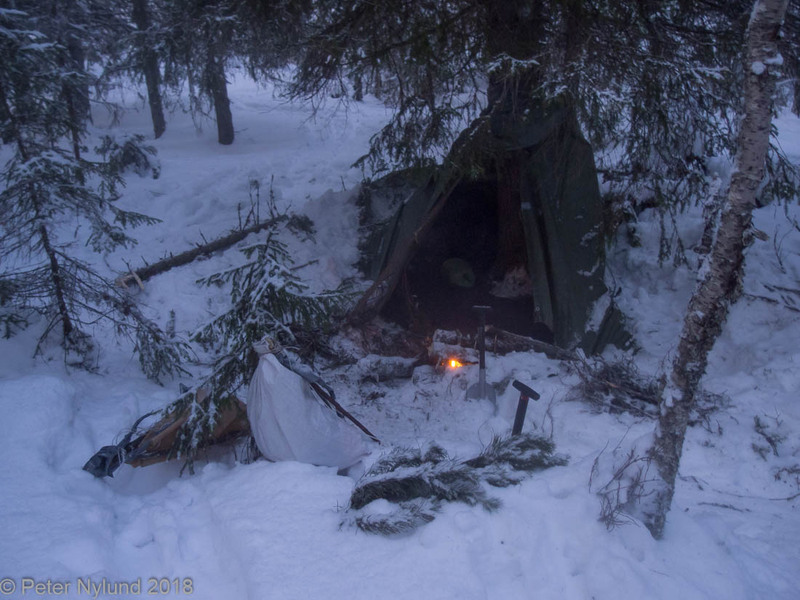 The tarp is erected over the skis and poles for the night, but partly open in the picture since I was about to make a small fire. 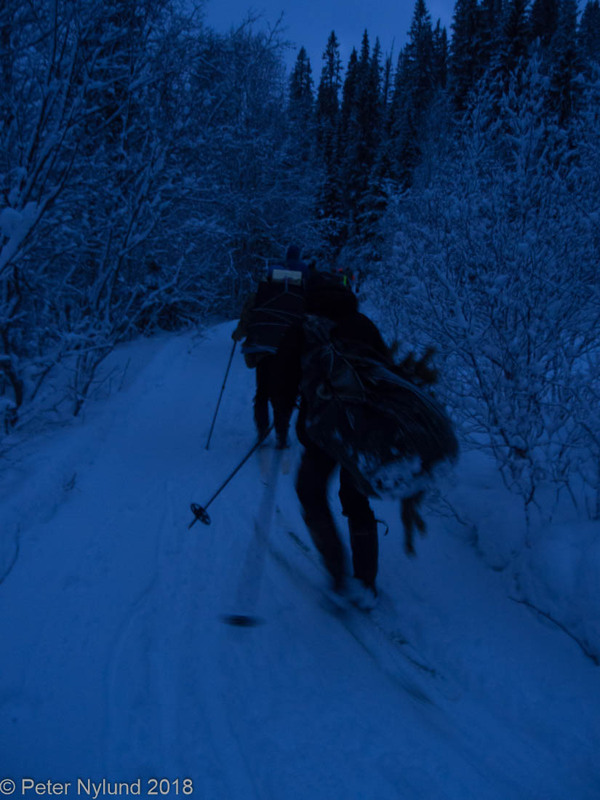 Skiing to the following shelter place. (Picture by Danni). 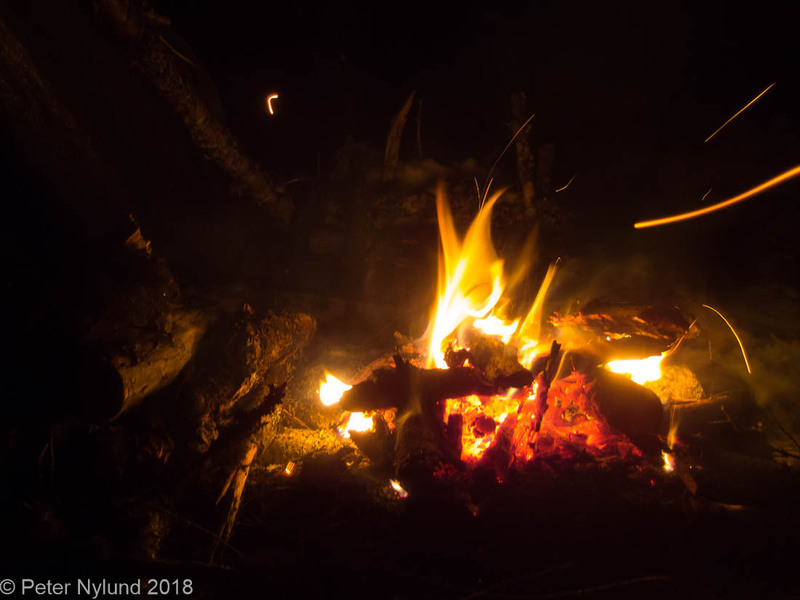 This night wasn't otherwise too bad, and I think the shelter was quite nice in that it caught some of the warmth from the fire. The toes weren't as cold this night. Unfortunately the wind had turned a little since we built the shelter and we had some amount of smoke in it. 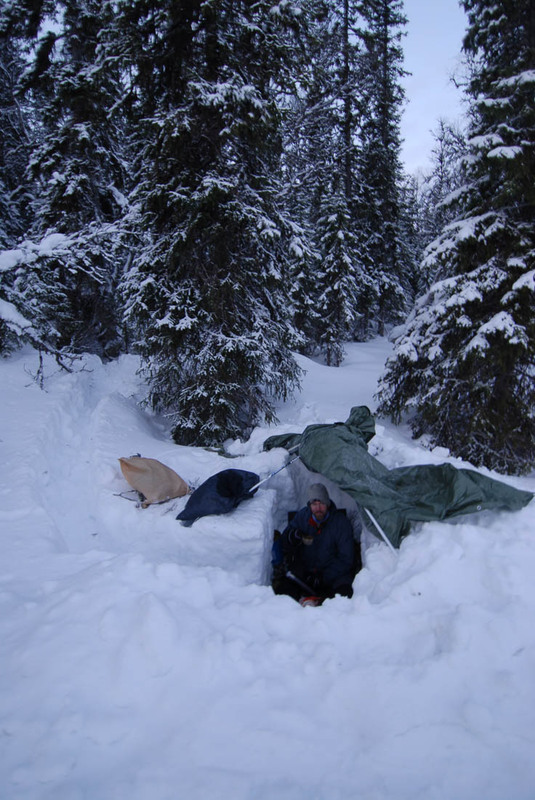 Our shelter in the morning (at this point we had already used most of the fire reflector for firewood). 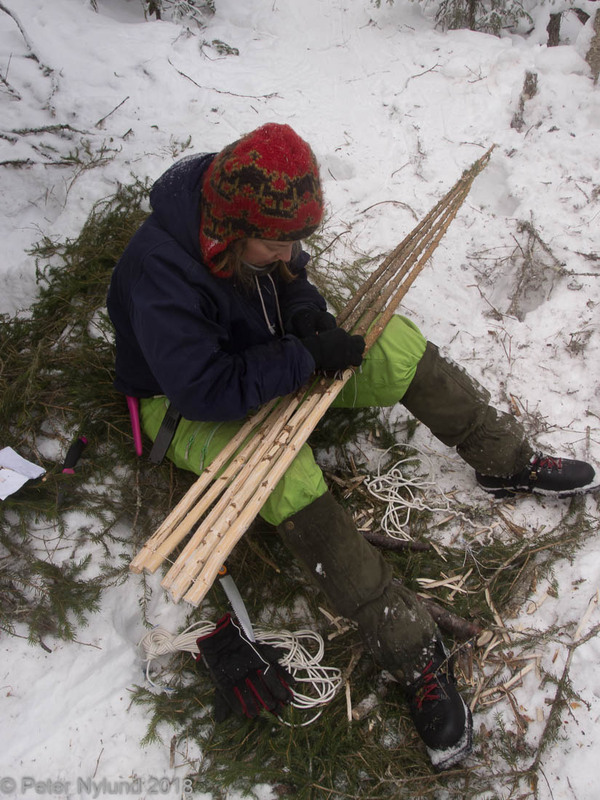 Sara's snowshoes turned out great. 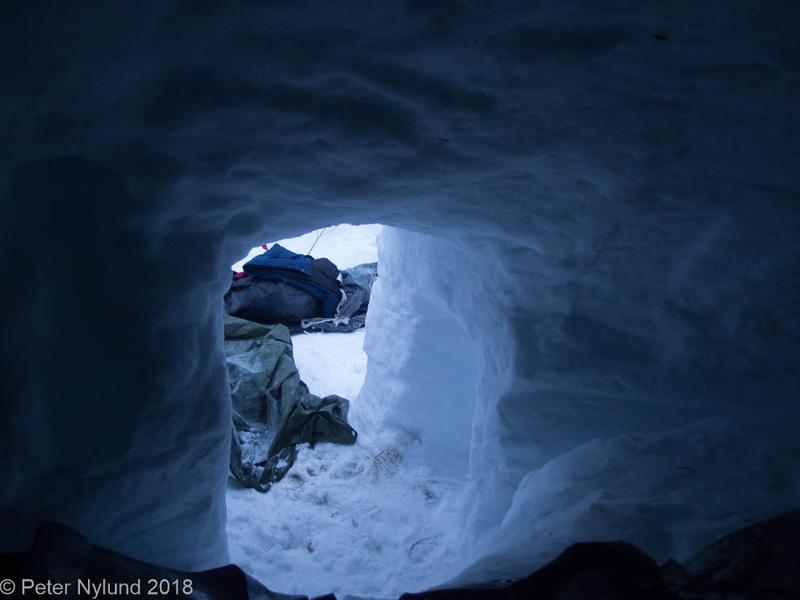 At one o'clock in the afternoon we were again at the snow piles, this time with the task of hollowing them out to get room for four persons to sleep in. A lot of work, but a lot less than the building the pile. 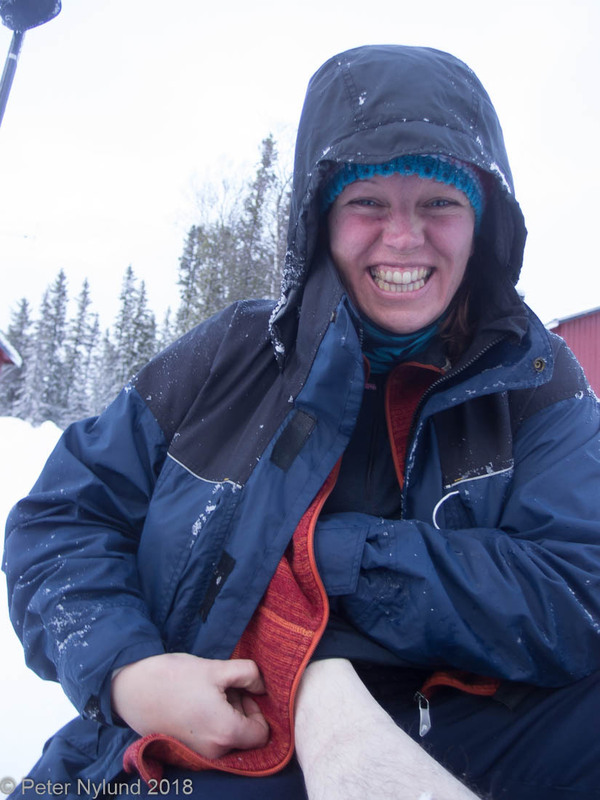 At the same time, we also cooked two willow ptarmigans for our four person group, given to us by Ingvar. They first needed to be thawn in warm water to be able to do anything with them, but later when they had cooked for a while they tasted quite great. The amount of food in them was rather small, though. Second picture by Danni. The place we were at was quite nice, but we didn't have the energy or time to enjoy it. Our assistant instructor Danni did, however. 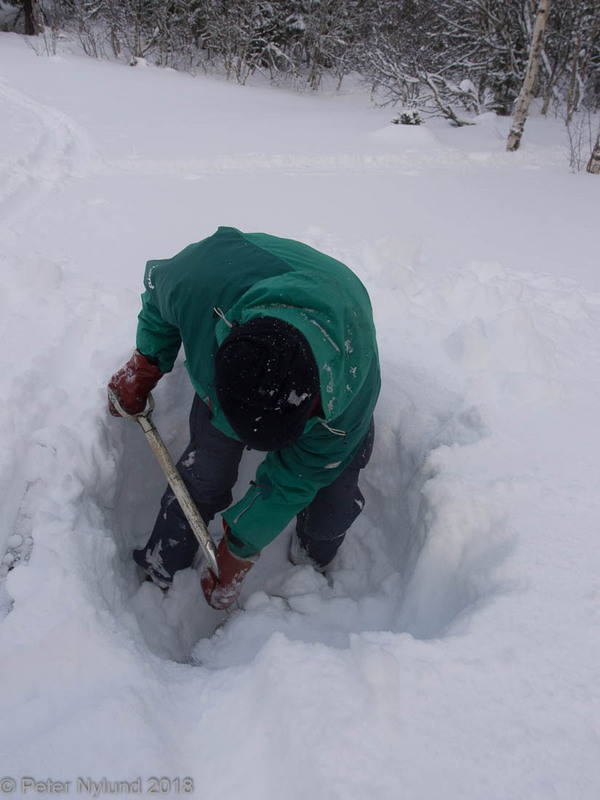 While digging out the snow we had a fire going with warm water to drink. It got colder and the smoke stayed in clear layers. Picture by Danni. At this point it got colder and was -20°C at its coldest. The temperature inside the quinzhee was considerably warmer, though. The night was still rather cold for me and especially my poor toes. Fortunately I got a least some warmth from Bettina, who I slept back-to-back with. 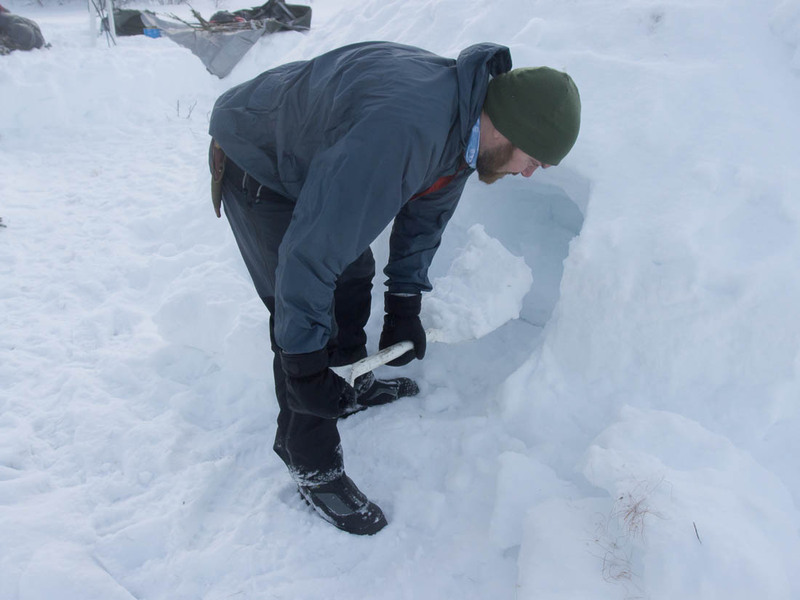 The shelter did however protect us completely from the wind, which had risen during the night. 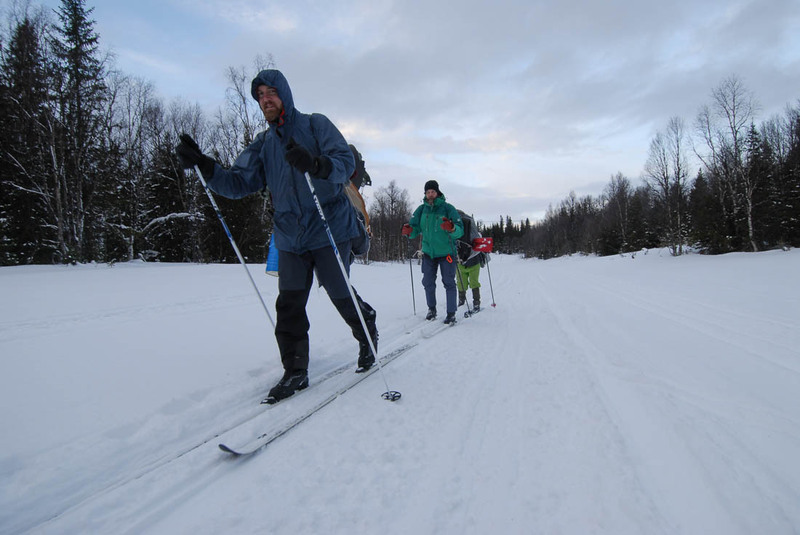 The next morning started with a little skiing, as Ingvar though we needed to move to drain us from energy. It had already become clear that making us tired was part of the game. I was pretty much a zombie since my vomiting, but it was more of a mental slowness than actual physical. The nausea continued to affect me, though. 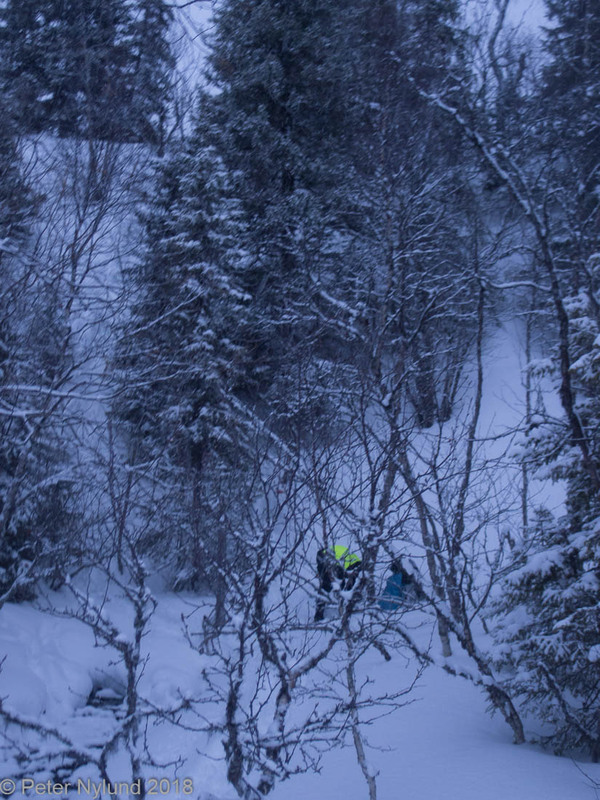 The skiing still went pretty well without feeling to hard. Picture by Danni. 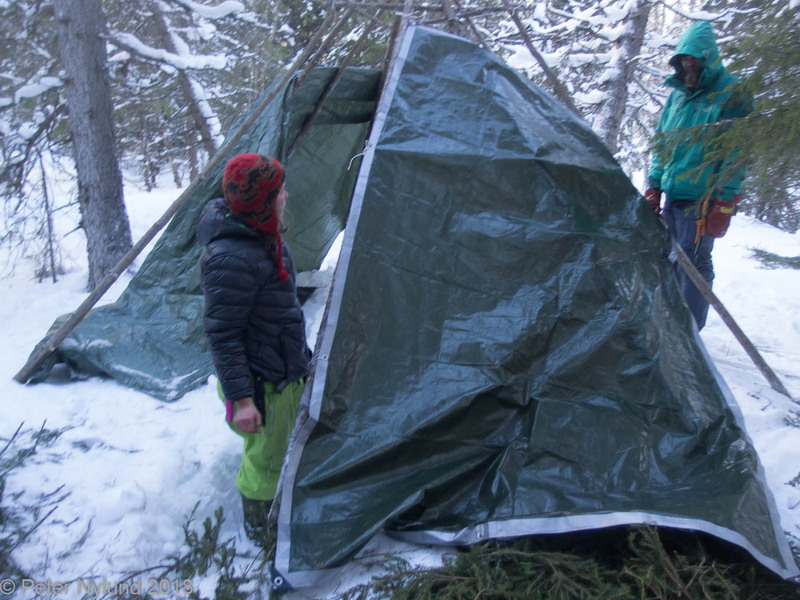 The final shelter was a fire shelter for four persons. 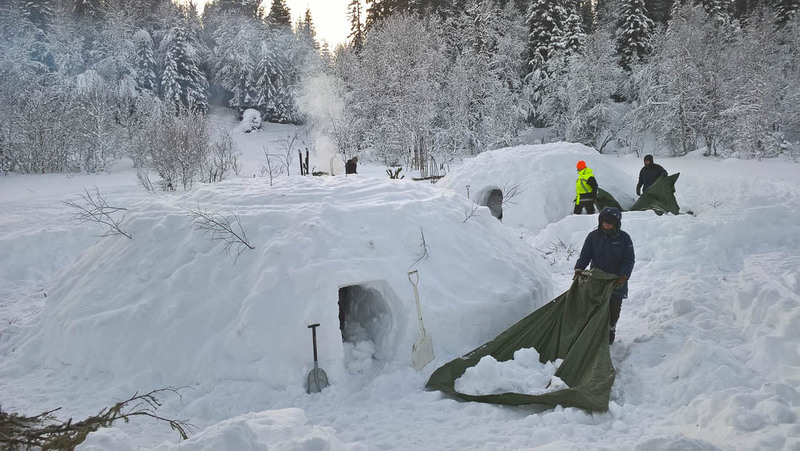 The aim was to make a roundish shelter with a smoke opening at the top and benches to sleep on at the side. At this point I did feel the mental slowness and Sara, who now clearly was the sharpest one of us, took command and made things happen. This particular place was nice in that we had a stream with running water close to us. 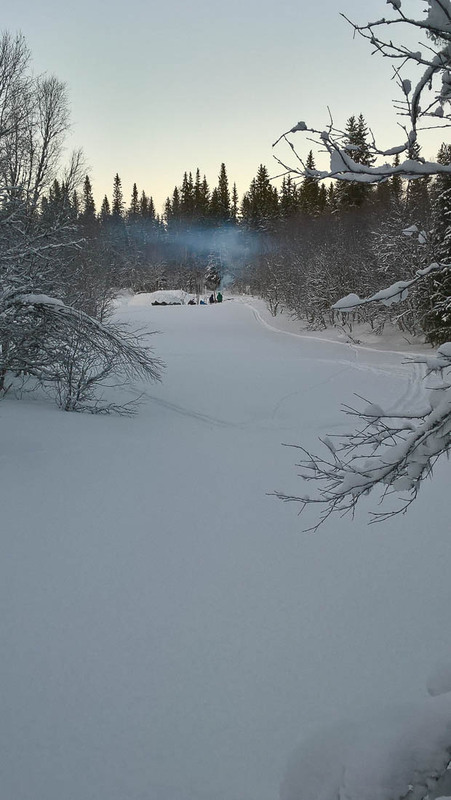 By now I had developed a real dislike for the smoke and soot flavored water resulting from melting snow in an open bucket on a very smoky fire and getting fresh water felt very well. 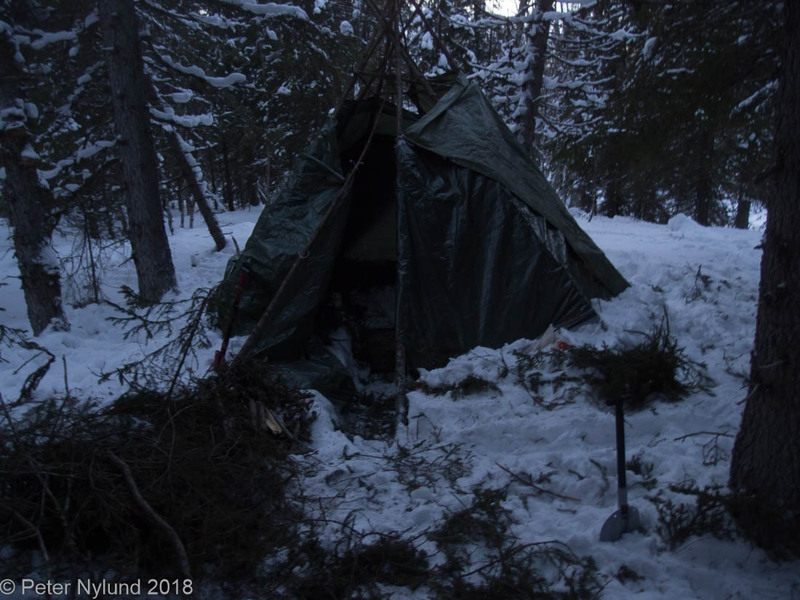 The shelter worked fairly well, but the firewood was poor. Spruce only and rather damp firewood, which led to a lot of smoke. Picture by Danni. The final morning we were to be ready fully packed and with our snowshoes on at eight in the morning. 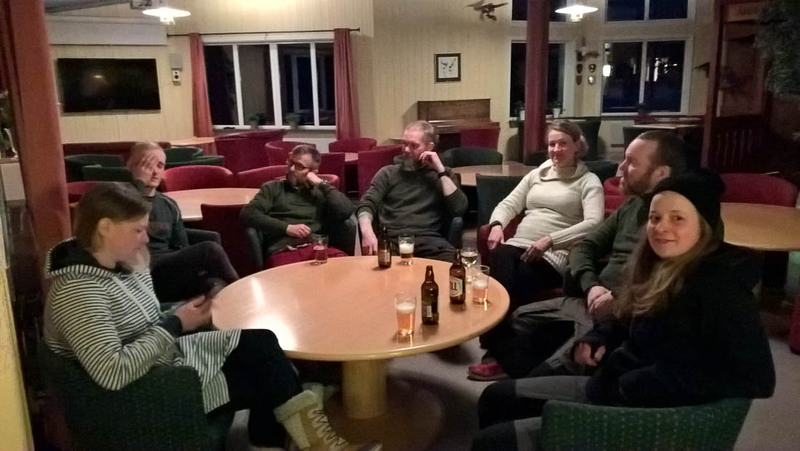 Ingvar promised that the last exercise was to be the physically most demanding. 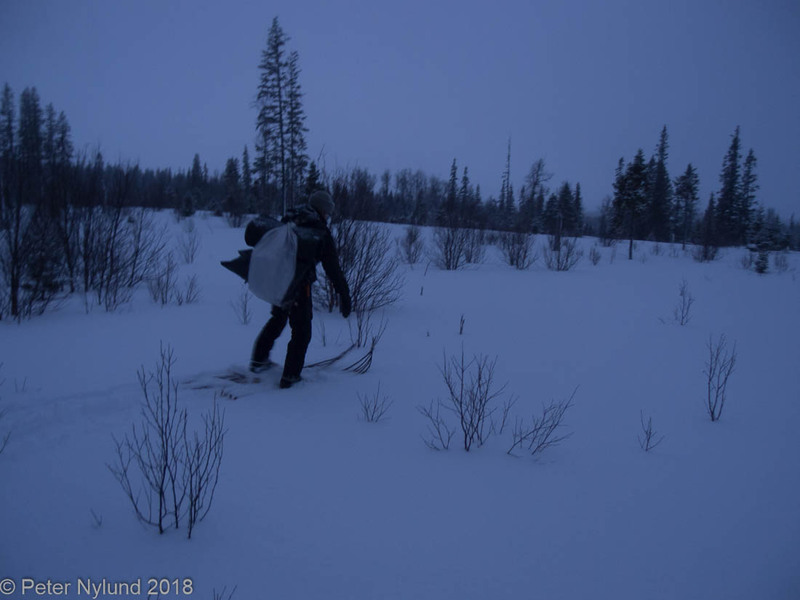 Getting through the route without snowshoes would be very difficult, with about one meter of snow loose enough to sink all the way through, but hard enough to make moving through it extremely slow. 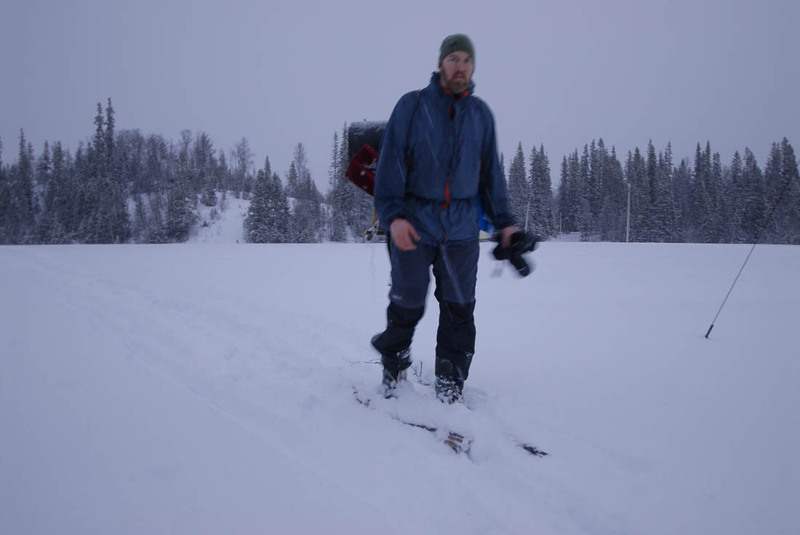 My main concern was whether the snowshoes would hold together. The showshoeing actually went rather well, and again it turned out that my slowness and tiredness was mostly mental, since I managed to move quite well with the snowshoes. During the very steep section shown below I took the snowshoes off, since there would be a real chance of breaking them otherwise. Me arriving at the target. 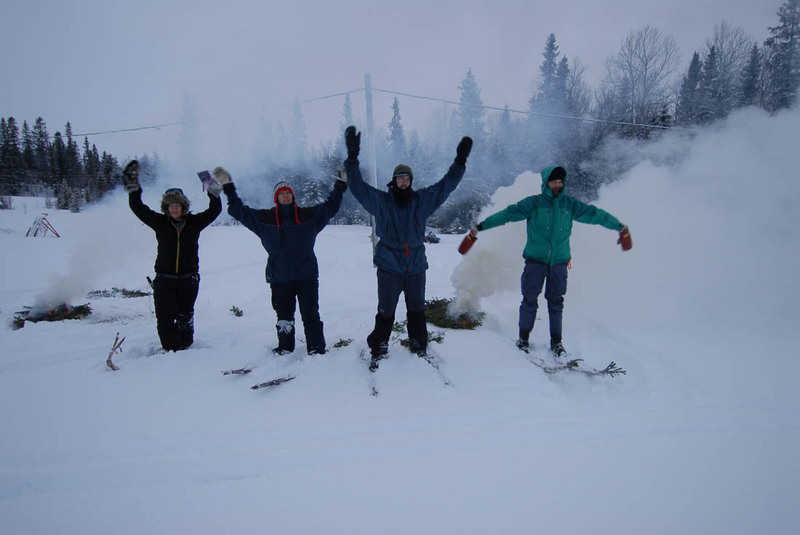 The snowshoes didn't even break. Picture by Danni. To be rescued we had to make a signal fire. And that was it. We were back in time for a quick shower before lunch, which was a soup, perfect to make the stomachs used to food again. After lunch we had plenty of time for sauna and a little beer before the festive dinner, which was outstanding. The next day, Tuesday, we drove back to Stockholm for the night ferry to Turku. All in all a very interesting course, which again taught us a lot. Pure type 2 fun this time, though, since it really was no fun during the course itself. Too cold, too little food, too much smoke and too much work for that. But now, after having been home for a week it feels rather good. A big thanks to all my course comrades for everything. 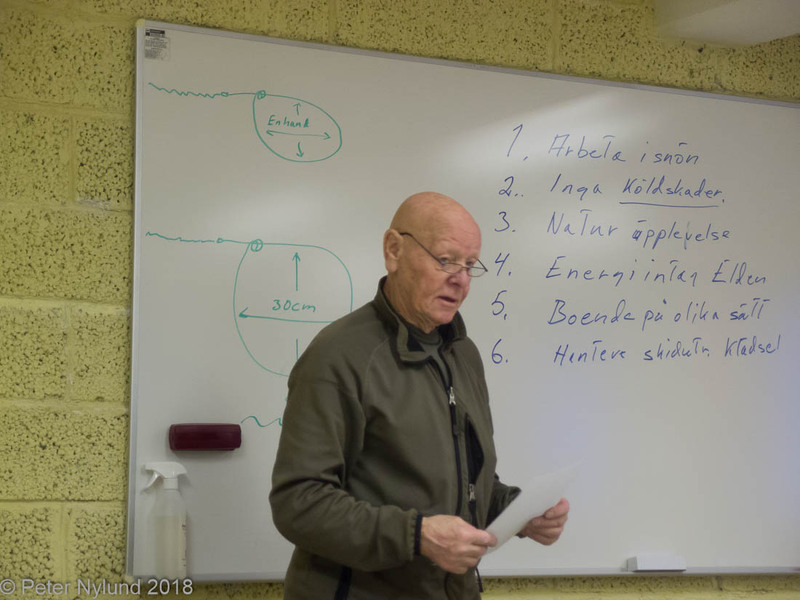 And it really was an honor to take these survival courses with Ingvar Krancher, one of the foremost experts on the subject in Scandinavia.